Bursting with antioxidants, it's time to add some fruity glow to your skin courtesy of serums instead of oranges. Vitamin C has countless benefits for the body. The body can't produce it all by itself, and need you to feed it with what it needs. The benefits of vitamin C include protection against immune system deficiencies, cardiovascular diseases, prenatal health problems, eye disease, and even skin wrinkling. But you can secure a better future for your skin, without needing to consume a bag of oranges daily. Positive Health Wellness discusses the positive effects of applying topical vitamin C regularly, adding that it's packed with antioxidants, which help protect our skin against free radicals like toxic chemicals and pollutants like cigarette smoke, which lead to a faster ageing skin. Free radicals also damage collagen, which ultimately keeps our skin looking plump and young. Local dermatologist, Dr. Nomphelo Gantsho says that ascorbic acid, also known as L-ascorbic acid, has the most skin-related research of any form of vitamin C. It’s the form of vitamin C that is used most often as a topical application. When properly formulated, ascorbic acid helps create younger-looking, firmer-feeling skin while signs of uneven skin tone and spots seem to disappear. The antioxidant properties of vitamin C (ascorbic acid) and its role in collagen synthesis make vitamin C a vital molecule for skin health. Dr. Gantsho also notes that studies have found that higher vitamin C intakes were associated with a lower likelihood of a wrinkled appearance, dryness of the skin, and a better skin-aging appearance. Dietary and topical ascorbic acid have beneficial effects on skin cells, and some studies have shown that vitamin C may even help prevent and treat ultraviolet (UV)-induced photodamage. Heliocare 360° Mineral Fluid SPF 50+, R426. Lamelle Recharge CE Complex, R760. 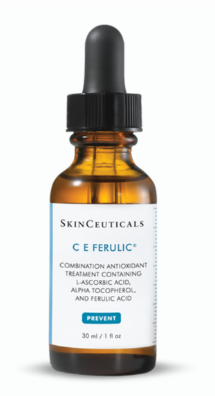 SkinCeuticals C E Ferulic®, R2,225.